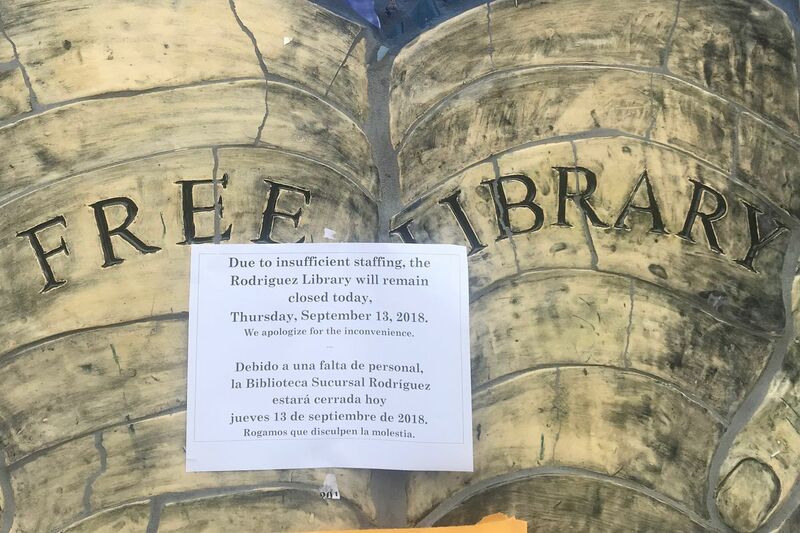 On Thursday, Sept. 13, 2018, the Ramonita G. De Rodriguez branch of the Free Library of Philadelphia in North Philadelphia was closed due to low-staffing. The Rodriguez branch is one of many across the city that struggles to stay open day-to-day. Philadelphia is wisely spending millions to renovate city libraries, but too frequently, residents find the doors shut, with a note saying there just wasn't enough staff to open. This all-too-common event begs the question: What's the point of spending millions to refurbish Philadelphia's public libraries if the city can't staff them? This year, branches across the city closed 372 times. They closed without notice and left users without access to books, the internet for job searches, a safe place to do homework or school projects, and so much more. According to a recent Inquirer report, more of the closures happened in neighborhoods with high poverty rates, though the city denies this is the case. Calling libraries essential centers of the community doesn't even begin to cover the role of libraries in our lives. They hold the tools residents can use to make themselves better. Membership is free, and patrons can check out musical instruments, learn a language, attend lectures, and take courses. Not only can members use the library to find a job, but they can check out a tie, scarf, or even jewelry, so they look their best at a job interview. In one extreme case, the librarian at Kensington's McPherson Square Library has administered live-saving Narcan to opioid users. Library President Siobhan Reardon told staff writer TyLisa C. Johnson that her department's budget was cut a decade ago, which leaves her "constantly moving chess pieces in order to" keep branches open. The library, like other city departments, was hit with budget cuts in the 2008 recession, and its budget is slowly being restored to pre-recession levels. Still, those cuts were deep. Staff is down by about 150 positions from 11 years ago. According to city budget documents, there were 813 full-time positions filled in the library system back in 2007, before the recession hit. At the end of this March, there were 657. The cuts make staff allocation all the more important. Library leadership would be wise to plan better for the unexpected and study absenteeism patterns, so it can keep the branches open, especially on weekends. The staffing problem has lingered for years. In 2012, the Pew Charitable Trusts reported that Philadelphians don't use their libraries as much as their cohorts in other big cities because of the "extraordinary number of times that branches have experienced temporary, unscheduled closings in the past few years." Annually, an average 6 million people use the system's 54 branches. Soon, those branches will get some long-overdue attention. In the first two years of its Rebuild program, the city expects to issue about $90 million in bonds to refurbish libraries as well as parks, playgrounds, and recreation centers. But it is absurd to fix buildings and not supply enough staff to help people use them. Mayor Kenney and City Council should fix the staffing problem so that when libraries are repaired, they can better serve the city. Call and tell them that a city without fully-functioning libraries doesn't offer much hope to residents who want to better their lives, or their minds. If you want to help, go to https://libwww.freelibrary.org/support/. Use it to send a donation.